“Where am I? What happened? Why am I here?” DJ Fist asked out loud, feeling frightened, which didn’t happen too often for him. 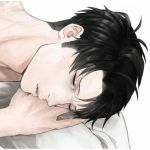 He looked around for awhile as he tried to calm himself down even further before he made himself get up. His limbs were protesting heavily but he knew he couldn’t lay there forever. He groaned as he used a nearby tree to help pull himself up and he slouched against it, panting as that alone made him tired. “Do I have phone coverage?” DJ Fist asked out loud as he reached down into his pockets. When he didn’t feel anything, he panicked as he frantically dug through his other pockets and was horrified when he remembered something. Though he moved slowly, DJ Fist went from tree to tree as he descended on the mountain. He was flabbergasted about this random event. DJ Fist wandered through and around the trees for a few hours, his stomach angry with hunger but DJ’s appetite not a priority at the moment. Suddenly DJ heard a hair raising snarling hiss from behind him. And it sounded like a very big cat. DJ Fist jumped and spun around, gasping as he saw the ferocious and vicious-looking animal. The pain in his body no longer mattered as there was only one thing to do. “Run, DJ, runnnnn!” he cried out loud before running away as fast as his legs could carry him. The cat let out a screech as it ran after him. And it caught up. It roared before jumping at him, teeth bared and claws at the ready to rip into him. The large cat pounced on him, knocking DJ to the ground and it bit into his arm and its claws caught his face and neck and a spot on his side. For a moment it looked like the cat would kill him until the sound of hooves could be heard approaching at full speed. Something knocked the cat off of DJ and the feline screeched at whatever interfered. “PICK A GOD AND PRAY!” Someone with a deep booming voice bellowed. It was a knight on the back of a horse and he attacked the cat using a long intimidating spear. DJ Fist was in too much pain to completely comprehend what was going on but he could see the form of a knight and he breathed a sigh of grateful relief that he was not ripped apart again and that someone had come to save him. The knight fought the feline off and when it was gone he jumped down from his horse and went over to DJ quickly. The knight knelt beside him and took off his helmet revealing a face that was a mirror image of DJ’s only somewhat older. “This looks bad.” He said before taking off the red cloak from his back and tearing it like tissue paper and wrapping the cloth tight around DJ’s wounded arm and side and doing his best to dress the wound on DJ’s face and neck. “You're lucky it didn't pierce a main artery or vein.” DJ’s knight doppelganger said to him. DJ Fist looked up at him weakly and tried to look at him clearly. He wasn’t comprehending at the moment the striking similarities between the two. “Th-th-thank you for s-saving me” DJ Fist said quietly, but hissing in pain as even talking was making his face hurt. The knight got on the horse behind where he’d put DJ then he urged the horse on with a sense of urgency. DJ Fist groaned in pain as he was bounced around from the horse’s gallop, and he was fighting to stay awake, which he did, but a part of him wished he could fall asleep so that he didn’t have to feel or think about the personal hell that he was going through right now. It was a little while before the horse stopped and DJ felt other hands on him, lifting him off the back of the large horse. The sun was high in the sky but… The sky was purple. DJ could feel someone fussing over him and he felt someone pull the quickly done dressing off his neck and face and ice cold water was poured on the wound. Faces were muddled for him so all he could see were shadows, shapes of people leaning over him. DJ Fist moaned softly in relief, the cold water giving him some form of pain reduction that he was desperately craving. Every minute felt like an eternity for him, and he hoped with all this might that this torment would soon end and he would feel better again. He felt the cold on his other wounds, and eventually the pain subsided dramatically. “Ohhhhhh….muchas gracias (“thank you so much”)” DJ Fist said out loud, his face no longer stinging with pain, though it did feel a bit numb from all the cold water poured on it. “Denada mis amigo.” (You're welcome my friend) A woman replied. “Des. His wounds are healing but he’ll have some nasty scars.” The woman said to someone nearby. Because DJ Fist’s face felt better, he turned the direction of the knight’s voice and his eyes got wide as soon as they looked at his face. He blinked a few times and nearly pinched himself to make sure he wasn’t seeing things but what he was seeing was real. The knight...looked like an older version of him! “Not quite, man. I'm an older alternate version of you. Just as you are a younger alternate version of me.” The knight said as he turned his head to show DJ that he had no scars on his face or neck where the scratches were currently on DJ. “Maybe so. But dude you're one lucky ducky because I just saved your life from a demon.” DJ’s alternate said. DJ Fist, who had been lying down, shot up so fast that his wounds began to ache, and he groaned as he gently laid his body back down. “I’m on a different planet?” he asked, even more shocked than before, “... So I’m nowhere near home…? Oh Kaysha…” he said as began to feel emotional, upset that his girlfriend would no doubt be freaking out about his absence, and he hated that he was separated from her. “We're you with anyone when you were abducted?” the woman asked him. “Des. I'm done.” The woman said. “Thanks, Sarina.” He said with a nod. “Siren sense?” Des asked and Sarina nodded. “You’ll just be sore as hell for a few days.” Sarina said. “I'm not as good as Mike but I am pretty awesome.” Sarina joked with a smile. “Dead. Dragon kind was nearly made extinct. The oldest dragon in existence currently is Pyrah. She's two hundred and twelve years old. The only reason dragons still exist is because the eggs that the sixteen mature dragons were hatched from were enchanted.” Sarina explained. DJ Fist felt saddened. “That’s horrible!” he exclaimed, “Who or what killed so many Dragons, and why?” Contrary to Drago and his father Shendu, who were demons, he and his crew all found dragons fascinating, and he knew Cassie felt the same way. “Humans corrupted by dark magic wiped out all living Dragons of the old era that we know of, seeking to obtain immortality. They failed to become immortal but Dragons were extinct for over a thousand years.” Des said. “What's done is done. The important thing is that Dragons are finally making a comeback.” Sarina said. “How about we take you to the Weyr and introduce you instead?” Des asked. New chapter is finally up for DJ Fist's short story! In this chapter, DJ finds himself on a whole new planet (sound familiar hint hint Cassie's story?) and is thrown in the jaws of danger rather quickly, only to be saved by... himself? Read on! A week after the two Dragon Riders came to visit, the three young teens were supposed to leave the farm but Kaine and Ash delayed them for two days because of their fear and nervousness. The family had packed Kaine, Ash and Cassie’s things they were taking to the Weyr into a horse cart in the barn. They were going to try to leave again in the morning. Third time's the charm. “What do you think, guys? You think you’ll feel okay with traveling to the Weyr tomorrow? Beginning a new chapter in the book of your lives?” Cassie asked Kaine and Ash as they sat together in the loft of the barn, looking out the window that gazed upon a good part of the farm. Cassie sighed a bit. Admittedly, she was a bit impatient to leave, eager for this new adventure herself, but she knew that her feelings on the matter were not important, and that she needed to continue being supportive.